Dzogchen means the Great Perfection which is the natural condition of primordial potentiality of each individual. The method through which we enter into the knowledge of Dzogchen and discover our real condition is called Dzogchen Teaching. The Dzogchen Community is made up of those who are interested in following the Dzogchen teachings. 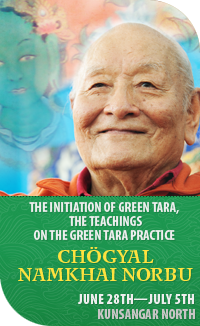 It was founded by Chögyal Namkhai Norbu in Italy in the 2nd half of the 60s and since that time it had been rapidly developing all around the world, taking on a completely international dimension.